You had a brand new Android device? Or maybe you just retrieved an old smartphone because your iPhone is broken? In any case, welcome to Android! You will love. But where to start? Good question. You need to transfer data from iPhone to Android. Switching from an iPhone to an Android is not that complicated, but it requires a little effort. This is the case every time we have to change ecosystems. 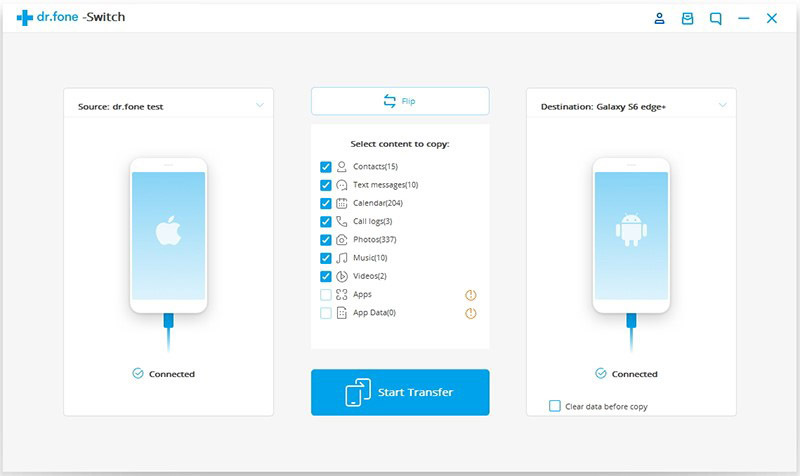 How to transfer contacts from iPhone to Android? In short, follow our guide! Our guide is organized by sections, including recommendations on Android smartphones, many practical tips, tools to transfer your data, or even unique things on the Android platform including phone to phone transfer. Keep reading! It’s a question that comes up again and again. Already, know that it is not because you tested Android in 2013 that you know this system. It has evolved a lot since then, it is much more mature and the devices have an excellent quality-price ratio. Even a device at 200 dollars offers a good user experience. With an Android phone, you can carry out various functions and download many useful applications from Google Play Store for free. Most Android applications are free so even with a simple Android phone; you can have an electronic assistant that makes it easy for you to run various activities. The first choice that leads to Android is the change: the iPhone are all alike, on Android, we have a choice. Just look at the buying guides in the next section to realize the richness of the catalog. But it’s also personalization once your Android in your pocket. No Android is alike, it’s promised. On Android, you can change everything. The system is designed so that you can modify your application launcher, your unlock screen, your SMS application, your photo gallery, your default Web browser, your telephony application … all applications, like the most basic , can be modified. Finally … Stop the prejudices! Android is now very stable, secure and accessible. Android is constantly evolving and Google has taken care to bring tremendous user comfort to its system in recent years. The experience is much more accessible. This can be seen from the first start, during the configuration of the device. It is true that Android has suffered from youthful defects, but since Android 5.0, the experience has become very interesting. Regarding security, what you can hear in the media is not reassuring … by following our advice, nothing will happen to you. Google is now making a real effort to make the system as safe as possible. At startup, by encrypting your data, but also thanks to Google Play Services that can quickly deploy patches to fill the gaps discovered. iPhone to Android transfer does not mean you have to leave behind all these precious photos and videos. It would be horrible to lose them by switching to Android, right? You could probably do things the old way and manually transfer the files … it works and it avoids going through an online service. Connect your iPhone to your computer, transfer your photos and videos … and do the same thing the other way with your Android. Or you can just take advantage of the cloud storage services that are very convenient. Why don’t use dr.fone – Switch? This is a great alternative to transfer files from iPhone to Android or vice versa. You can transfer files in just one click. dr.fone – Switch is a smart tool for transferring all files including contacts from iPhone to Android (or vice versa). You only need less than 5 minutes to complete your task. This tool works perfectly on various popular mobile brands such as Nokia, Google, Sony, Samsung, Apple, LG and so on. It is also compatible with Windows 10 and Mac 10.14. 1. You simply connect your two devices (iPhone and Android) to your computer with a USB cable. 2. Open the program and start running. 3. You can start scanning files by clicking “Start Transfer”. If you want to be more selective, you can check “Delete data before copying”, making sure you don’t copy the data you don’t need anymore. Note: The dr.fone application is very safe; no need to worry that some of your data is lost or damaged after being transferred to a new device. You can follow other instructions on the official website of dr.fone. Overall, dr.fone ensures that anyone can transfer files from iPhone to Android (or vice versa) without any IT experience. Hopefully this article can help you to move important data from old phones to new phones. We hope you can take some benefits. Thank you for reading!